Suitable for beginner to experienced kayakers; medium level of fitness required. This activity is not suitable for children under the age of 7 years. 1 adult required per child. All guests must be able to swim and speak & understand English. 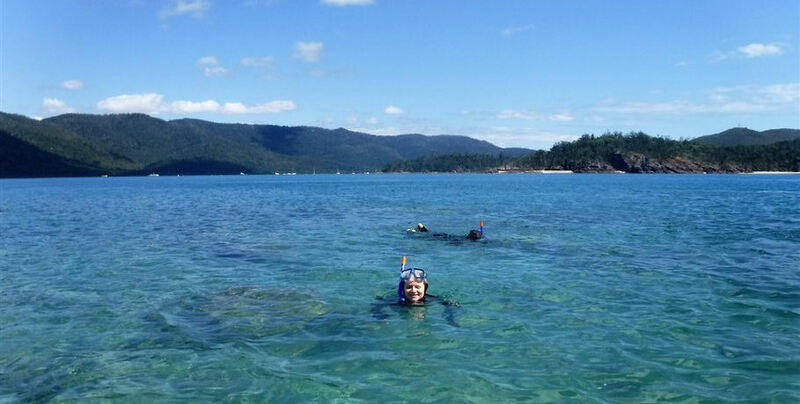 Your half day guided tour departs from the Salty Dog Sea Kayaking base at Shute Harbour and takes you over clear turquoise waters to experience the fringing coral reefs from a different perspective. Your knowledgeable guide will show you the nearby tropical islands and point out the diverse inhabitants including marine life and sea birds. 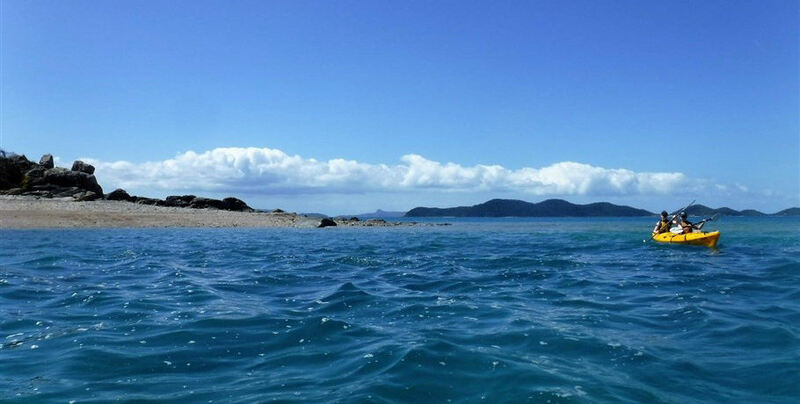 If you are lucky enough to visit between July and September, you may spot the magnificent humpback whales who travel to the Whitsundays to give birth in the warmer waters. Your tour also offers a stop at White Rock to swim and explore the island before enjoying cold drinks and a cheese and fruit platter. Please note: as tours are subject to weather conditions, our guides may divert to Cane Cockies Beach instead of White Rock to guarantee your safety. 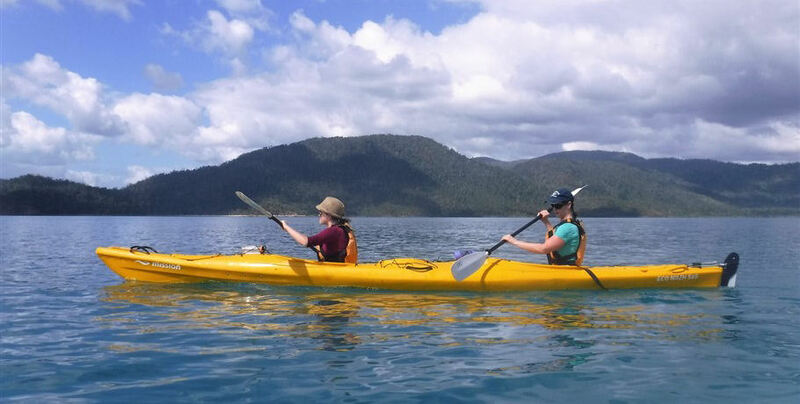 Advance booking of kayaks is advisable, especially in school holidays. We require either payment in full or minimum 20% deposit plus full credit card details to secure a booking, this includes full name on the card, credit card number and expiry date. Any balance owing will be taken on the day of departure, we accept Visa, Mastercard, cash or travellers cheques. 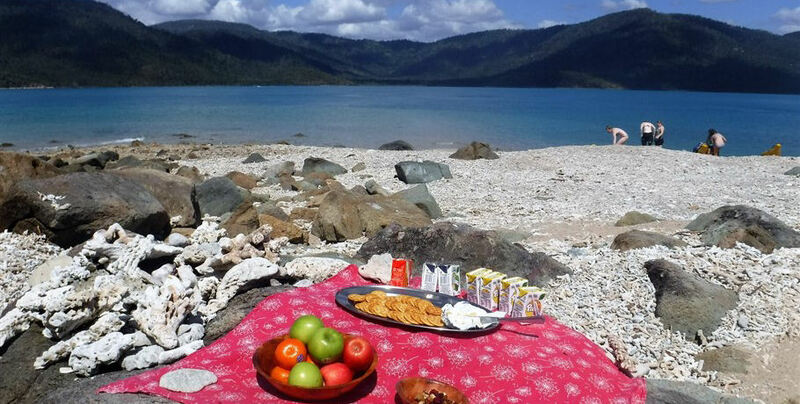 Camping permits must be booked in advance through Queensland National Parks and Wildlife Service, see camp site bookings for details). Cancellation by client – We understand that travel plans vary and that occasionally you may need to alter or cancel your reservation with us. Provided that sufficient notice is given, this is not usually a problem and we can usually organise a rescheduling of trip to a more suitable time or a partial refund. Short notice cancellations however means that we may have turned down other clients and will have occurred expenses for permits, food, transport, staff etc. In these instances, a refund is not available. Full details of our policy is set out below. Cancellation of half day and day trips within 48 hours will occur a 50% cancellation fee. No refunds are made for cancellations within 24 hours. All other cancellations incur a 15% of full trip price cancellation fee. Please note that in the event of a no-show, full payment is required. For overnight tours and kayak rental, 3 weeks cancellation notice is required. In such instances a cancellation fee calculated at 15% of full trip price will apply . At our discretion this fee may be used as a credit towards a future trip or hire. Cancellation of an overnight tour or hire agreement within 5 – 21 days will incur a cancellation fee equivilent to 50% of full trip price . No refunds will be made for cancellations within 5 days. No refund on any portion of a guided trip or hire can be made after departure. Please note that in the event of a no-show, full payment is required. 2 Catching the water taxi back to Shute Harbour, any costs incurred with this option will need to be Covered by yourselves. Groups – Occasionally only part of a group with a booking arrives with no prior notice of the partial Cancellation. In this situation, the redundant booking is payable by the group in full. Salty Dog Sea Kayaking reserves the right to delay, postpone, substitute or cancel a trip as a matter of safety for our guests and guides. We will make the final call whether to cancel for safety reasons on site at the time the event is scheduled to begin. If we must cancel for any reason, we are happy to reschedule where possible or we give you a full refund less any booking fees payable to your booking agent (please check their policies at time of booking). Please note we have a minimum number of 4 on overnight trips. We highly recommend you take out suitable travel insurance to cover any refund shortfall. Overnight and extended trips – If the forecast is for improving weather conditions, we will ask our clients if they can accept a delayed start or reschedule onto another trip. If the weather deteriorates once the trip has commenced to the point where safety is compromised, we may have to transfer clients via water taxi (we cover this cost). In this case a partial refund will be given based on a pro rata per day for each day not spent in the National Park. Half Day and Full Day Guided Trips – Once your trip has commenced there are no refunds. Occasionally, the guide may need to change the route of the trip for safety reasons or to suit the abilities of the group. 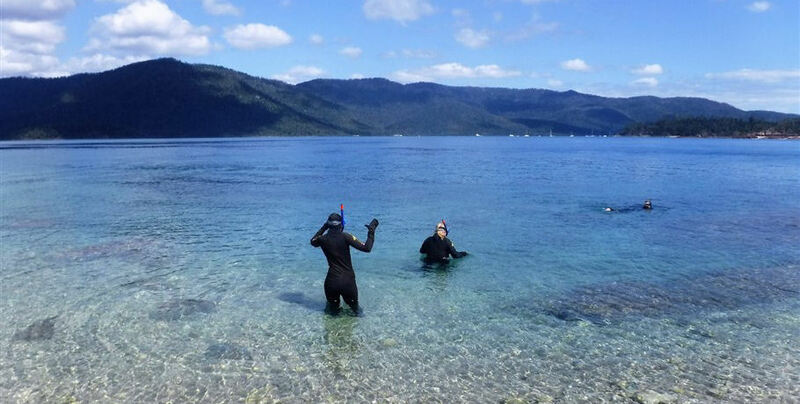 If asituation arises such as a dramatic worsening of weather during the trip and the guide deems it unsafe to continue, Salty Dog Sea Kayaking will cover the cost of the water taxi for our clients back to our base at Shute Harbour. 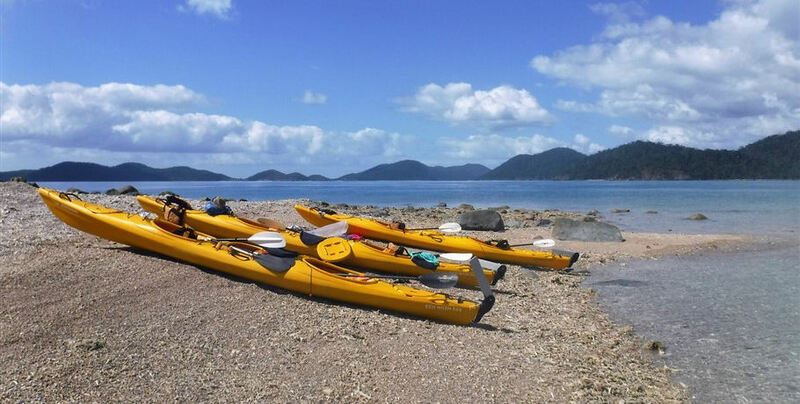 Kayak Rentals – Occasionally we need to cancel a client’s Sea Kayak Rental where it is evident that they don’t have the ability or skills required to safely undertake this activity. Where this situation arises, rental fee less commission payable to booking agents (usually around 15%) is refunded. 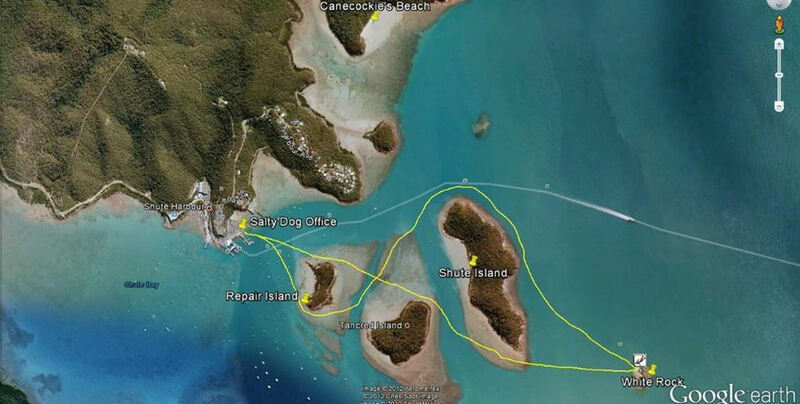 1 Salty Dog Sea Kayaking reserves the right to cancel a client’s tour in the event of non-compliance with the terms and conditions of the rental – in this situation, there is no refund. 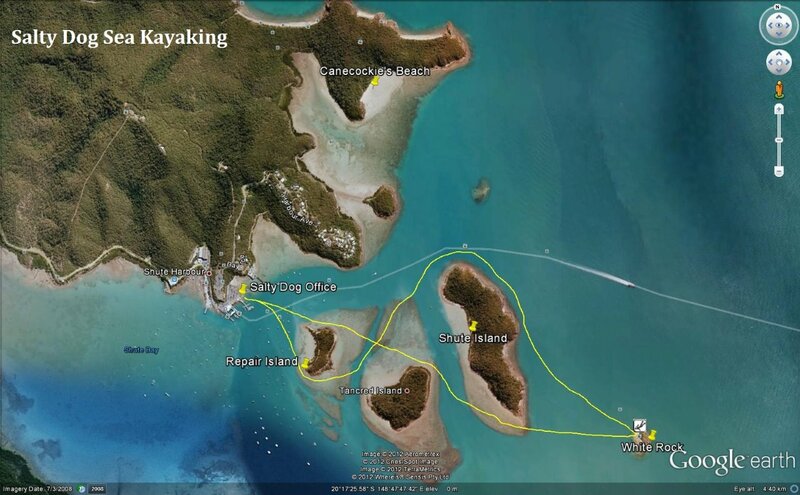 2 Salty Dog Sea Kayaking reserves the right to change the itinerary of a trip due to such things as prevailing weather conditions and group abilities. Such a change is not just cause for a client to cancel a trip without application of the cancellation policy. We strongly advise all clients to consider arranging appropriate travel insurance. 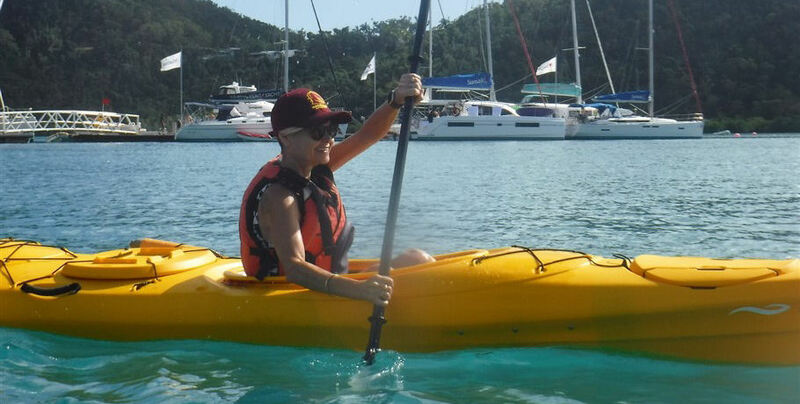 With rentals, clients are solely responsible for their personal equipment, including any luggage or personal belongings left behind at the Salty Dog Sea Kayaking Depot. Guided Trips – On our guided trips, we need to consider the expectations of all of our guests as well as safety aspects. For this reason, Guided Trips longer than a half day are usually restricted to paddlers 16 years and over, unless specific arrangements have been made (eg school trips, customised family tours). We have taken children of all ages from toddlers to 80 years of age, but please discuss your options with us prior to booking, we can help find a time with conditions suitable for your family’s needs. 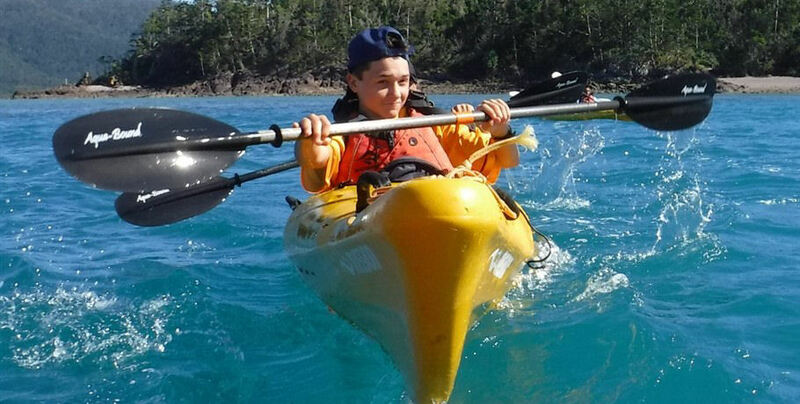 Freedom Rentals – Kayakers under the age of 18 must be accompanied by a responsible parent or guardian 18 years or older. Please discuss your options with us before hiring kayaks for youths or children.